Coming off four straight wins, VVV went into this derby clash with some expectations. New manager Ton Lokhoff took over at the end of 2011, to see his team take five wins from the first seven matches in charge, only losing away at relegation rivals Excelsior and newly promoted RKC. Away at Roda, who came of three straight losses themselves, things looked a bit different though. VVV were actually closer than the final score line suggests, but failed to capitalize on the opportunities they created in their excellent first half. After the break, Roda manager Van Veldhoven fixed his team in order to run out clear winners come the end of the match. The starting line-ups. Note Timisela's advanced position, adding weight to VVV's potential understrength in midfield. As usual, Roda lined up in their 4-4-2 diamond formation. Always posing interesting questions with this formation, Roda’s two strikers are an exception in the 4-3-3/4-5-1/4-2-3-1 dominated Eredivisie. Ajax countered them with a three men defense in their three clashes this season, much like N.E.C. did quite successfully the year before. Other teams just expect to deal with the expected 4v3 midfield situation by exploiting the flanks, a notable potential weakness of any diamond midfield. In personal terms, three important members of Roda’s presumed starting eleven returned to the pitch for this match. Back form suspensions were goal keeper Kieszek and deep-lying playmaker Vormer. In defense, left-back Jimmy Hempte returned after missing the better part of three matches due to injury, three matches that Roda indeed lost. Upfront, red hot top scorer Sanharib Malki, who just saw his contract extended at the club, former the usual partnership with Mads Junker. Manager Ton Lokhoff did turn things around in his spell in charge so far. Result-wise this has been shown in the fact that VVV picked up 15 points in his 8 matches in charge, compared to just 10 points in their prior 17 matches. 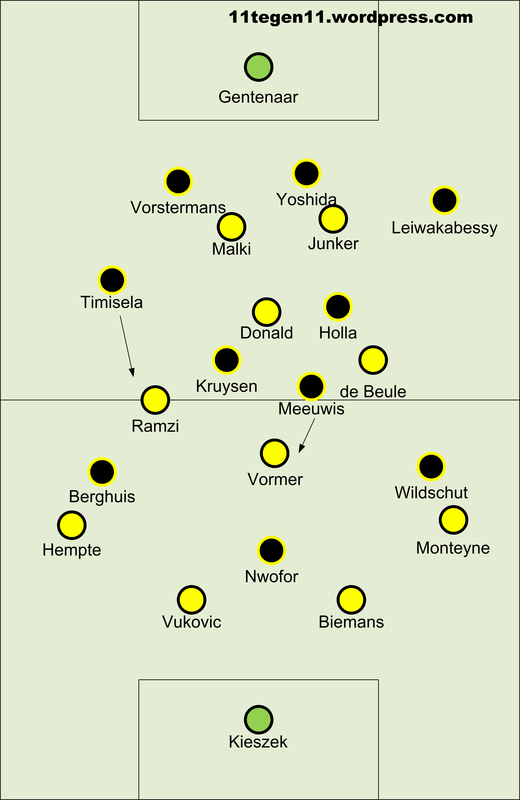 In terms of playing style, he introduced a fairly direct inverted winger 4-3-3 formation, aiming to exploit the pace of winger Wildschut and striker Nwofor. To be fair, he did have the luxury of some important players added on loan during the winter window, with Danny Holla providing a stable passing base for the midfield three, and young winger Steven Berghuis adding to the trickery of the offense three. In defense, Ismo Vorstermans, on load from Utrecht, helped his team, with VVV winning every Lokhoff managed match where they conceded one goal or less. Roda started quite aggressively, in the positive sense of the word. Their urgency in the first ten minutes allowed them to dominate possession, and like they prefer to do, to circulate possession through Ruud Vormer, for the blonde midfielder to open up the opponent with his excellent long and short passing skills. However, after about ten minutes, VVV fixed this issue, as tenacious midfielder Marcel Meeuwis started to man-mark Vormer out of the equation fir the remainder of the first half. Roda’s passing became increasingly hurried, with both central defenders often bypassing the midfield, and ending up losing possession due to incomplete long passes. An important aspect of VVV’s successful first half was the role played by right-back Timisela. He advanced into midfield, thereby pressing Roda midfielder Ramzi and fixing the potential 4v3 issue that VVV could have had in this diamond vs 4-3-3 situation. With Roda struggling to make the best of the majority share of possession, it was VVV who created the best quality chances. Striker Nwofor hit the post with a nice bicycle kick and saw another attempt just pass the wrong side of the post after an intelligent Berghuis through-ball played him in behind Roda’s defensive line. Finally, it was central defender and Japanese international Maya Yoshida who put VVV in front by responding first to a rebound after Danny Holla hit the bar with a long range direct free kick. One might have expected VVV to continue their excellent first half performance, but the second half showed quite a different story. VVV had problems covering the space in front of their defensive line, as their back four seemed to drop just a bit deeper, with their front three still playing quite high up the pitch. As a result, Roda’s four men midfield got more space to work, resulting in Vormer being able to see much more of the ball in the second half. VVV’s lack of grip on their opponents was well illustrated in an early second half series of Roda chances, and who else but Roda top scorer Malki managed to put his team level with VVV after Roda exploited one of VVV’s many early own half turnovers of possession. Shortly hereafter, another early turnover provided De Beule with a shooting opportunity to make it 2-1 for Roda. VVV manager Lokhoff took off midfielder Kruysen and winger Berghuis to bring like-for-like substitutions in the form of Linssen and Cullen. It proved difficult for VVV to regain control of the midfield area, the terrain where they clearly lost out early in the second half. Roda started circulating the ball with more confidence, and sitting on a 2-1 lead now, could apply more patience in possession. With a red card for VVV defender Yoshida, after a foolish elbow on Mitchell Donald, the match seemed over. VVV did chase the lead, squandering one big opportunity as Wildschut failed to crown an excellent solo run when Vukovic cleared his attempt off the line, but it was Roda who put the game beyond doubt when Malki scored his second of the game from the penalty spot. A match between two teams with different playing styles and formations always makes for entertaining stuff. And this edition of Roda – VVV was no exception. VVV managed to exploit Roda’s weakness in possession by creating a lot of first half opportunities with their pacy inverted wingers and the positional awareness of striker Nwofor, but they had themselves to blame for leading by just one goal at half time. In the second half, Roda took control of the midfield, as VVV granted too much space between the lines of their 4-3-3 formation. Ruud Vormer took control of Roda’s passing game, much as their manager Van Veldhoven likes to see, and his 87 ball contacts outshone not just VVV’s players, but his team mates as well. On top of that, he managed to win 12 duels, initiating some of those important early turnovers that Roda exploited for their first and second goal of the game. In the end, VVV did show their newly installed qualities in this match, but just fell short in terms of efficiency using their first half goal scoring opportunities. Roda deserves credit for jumping on their opportunities early in the second half, with top scorer Malki putting them on the right track. ← Soccer analytics: treat it like a ‘stop-and-go’ sport!